I started my batch in April, bottled in May, and tried it at the end of August, about 5 months later. At this point, it’s ever so slightly fizzy when first cracked open, and a beautiful light golden color. The flavor is somewhat herbal, but in a good, kitchen-not-medicinal way. I could pick up hints of the sage and rosemary, in particular, while the other herbs and grasses add depth and complexity. The flavor is long and changeable, with just a smidge of acidity. I could envision this mead being one of many made by the Beesburys, of Honeyholt. I could also see it as a mead from either a meadowy place in the reach, or perhaps even somewhere in the Vale. 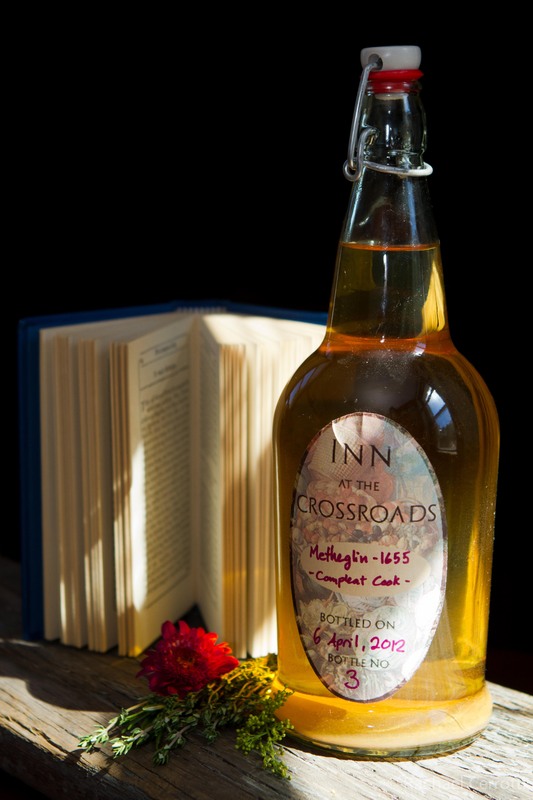 Or, since metheglin was originally a medicinal mead, it would be well suited to a sept, because of the joint healing/brewing skills of monks and septons. Get the recipe on the brew blog, Game of Brews! Also – I think your taste descriptions make a heck of a lot more sense then the poetic nonsense I’ve seen used to describe most wines! Fresh when I could get them (thyme, mint, rosemary, sage), dried in all other cases. Some were pretty tough to track down! As a mead maker I find you will get the better flavor from fresh ingredients. Dried ingredients will work but it’s always hard to know if they were treated in some way, though that does apply to fresh ingredients as well. The addition of fruits/herbs can help provide nutrients that honey does not provide. sorry, i’m new to making any of this. am i supposed to reinsert the spice bag somewhere at some point? Nope! The spices go in at the beginning, then come out for good when the mead goes into the secondary fermenter.